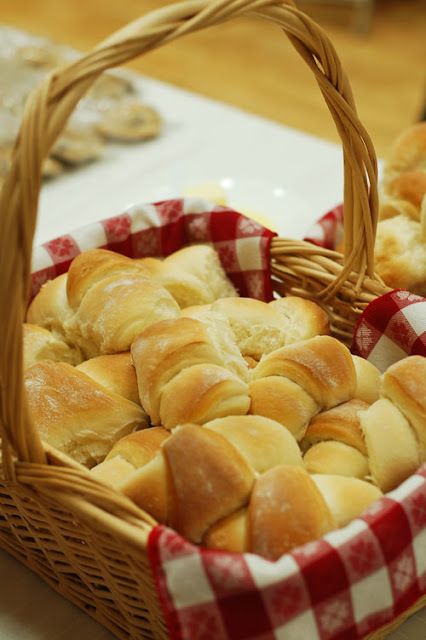 We held our Relief Society celebration last week. It was a delightful evening and I had tons of help from many talented sisters. Seriously love this little couple though--they make me smile. They were perfect to set the stage for our vintage theme. I had these branches and glass jar left from the wishing tree at Patrick and Ashlee's reception in January. 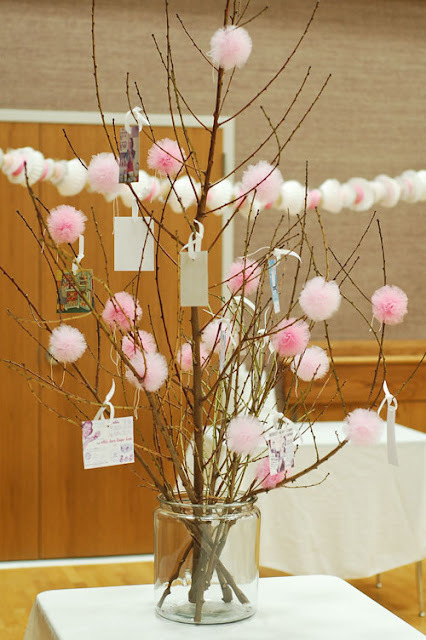 I created a "spring-ish" tree for the serving table by adding tulle pom-poms I made. I also tied a variety of vintage ads to the branches. The kids gave me a vintage Schwinn bike for Christmas. I LOVE it! 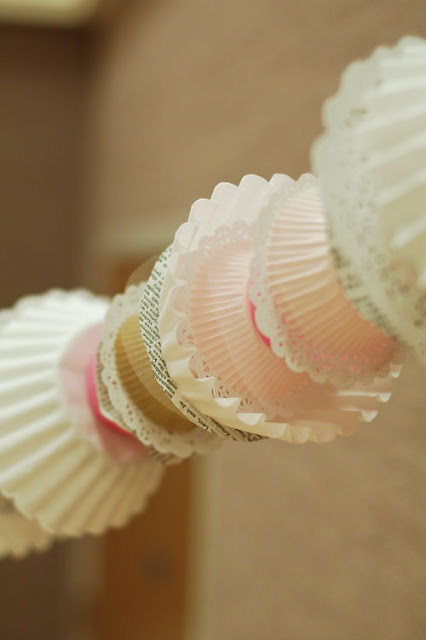 I set it against a pink vintage door backdrop and added a cupcake liner garland to greet the guests. Tracy B. made five of the most darling garlands from doilies, twine, patterned paper, ric rac, cupcake liners, book pages and burlap. 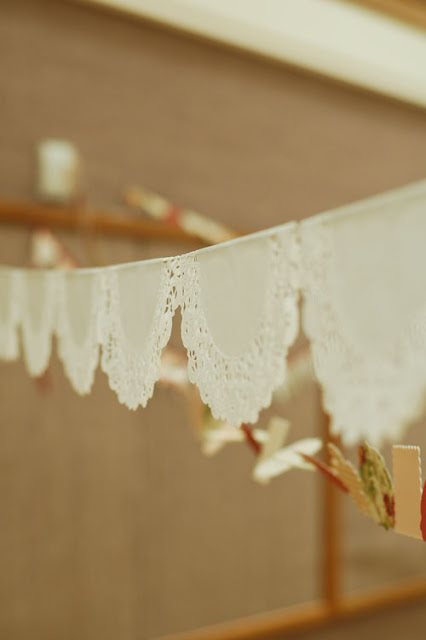 (Can't believe I missed a photo of the burlap garland, I loved it! It had fabric hearts on burlap flag pennants.) The last photo shows my favorite garland in the background. We hung them all criss cross at the front of the room. They were perfect. 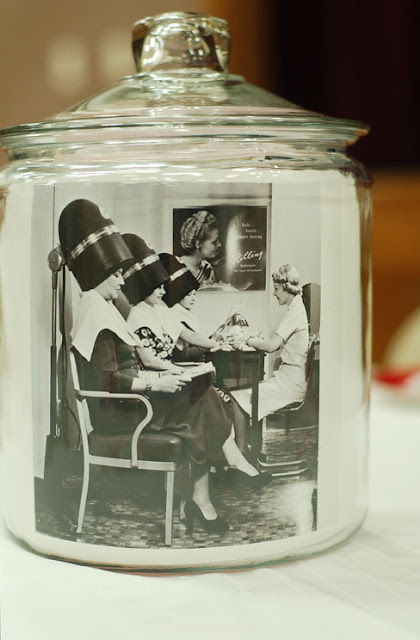 For the table centerpieces, Patti gathered up glass jars and lined the insides with vintage photos. She chose really great photos. 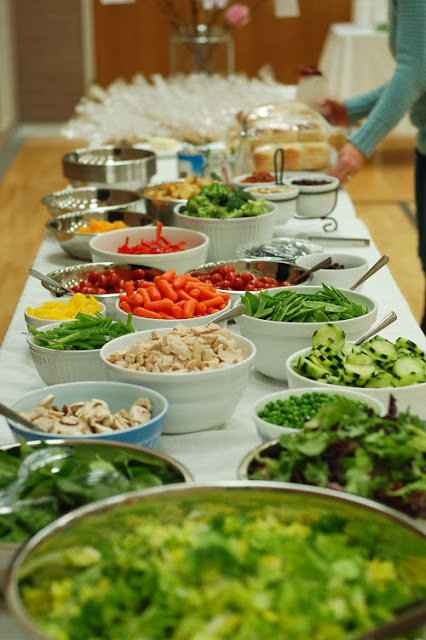 For dinner we stuck with our favorite (okay, my favorite) spring-time meal--a yummy and healthy salad bar. 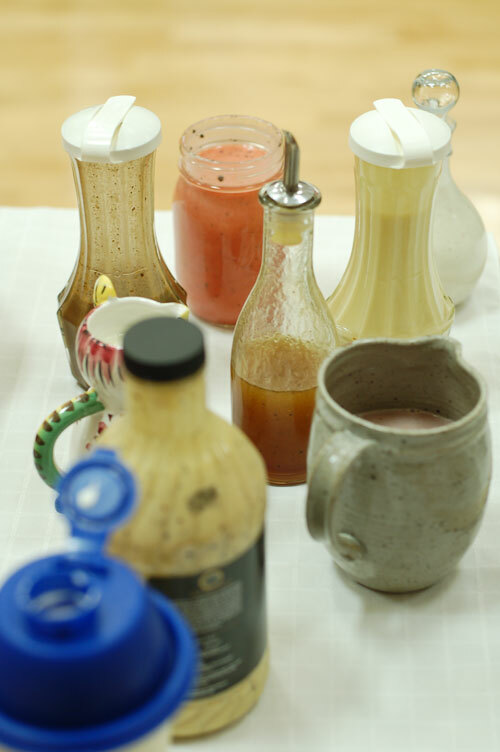 Louanne did an beautiful job gathering and preparing all the ingredients. Just check out that spread. We had sisters in the ward bring a variety of homemade dressings, and Marci and Tirage made homemade rolls. It was absolutely scrumptious. And since no meal would be complete without dessert, I asked Breanna to come up with something simple and delish. Oh my goodness, these Brown Butter Toasted Coconut Dark Chocolate Chip cookies were perfect and better than any bakery cookie I've ever tasted. 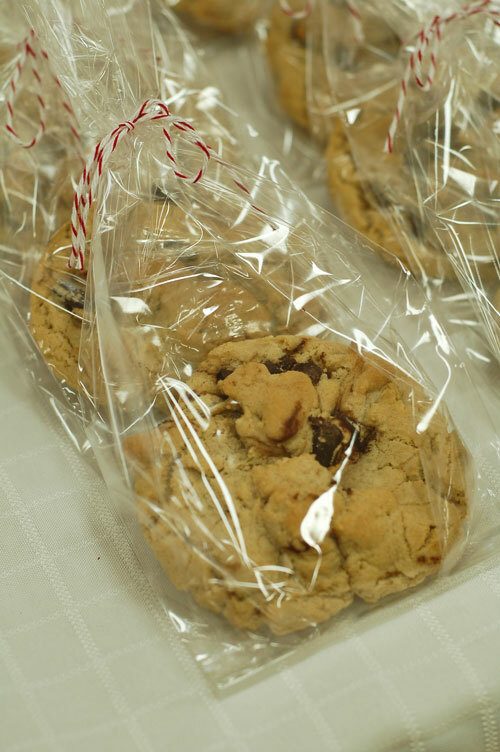 And I love the way she packaged them up--a simple cellophane bag tied with bakers twine. As we finished dinner, our RS President, Marci, gave a short message about simplifying our lives. 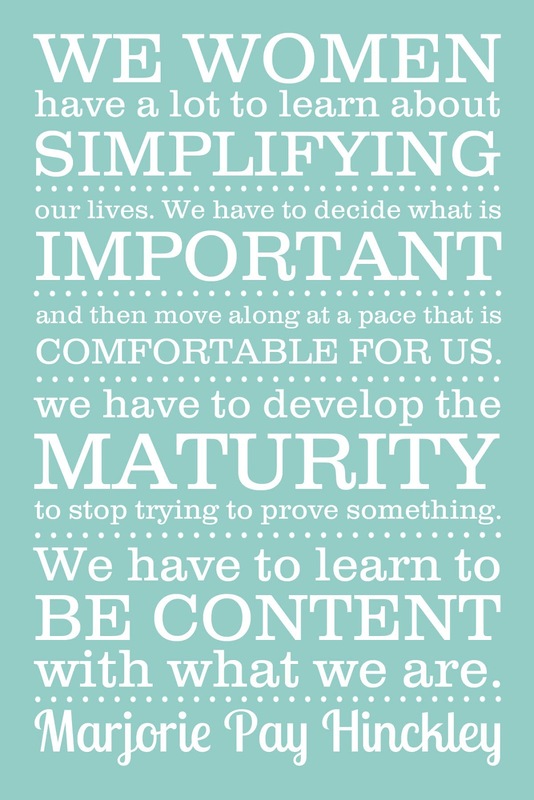 We gave each of the sisters a 4x6 print of this quote by Marjorie Pay Hinckley as a favor. I saw it here originally and loved it, but wanted something a little different to fit our theme. 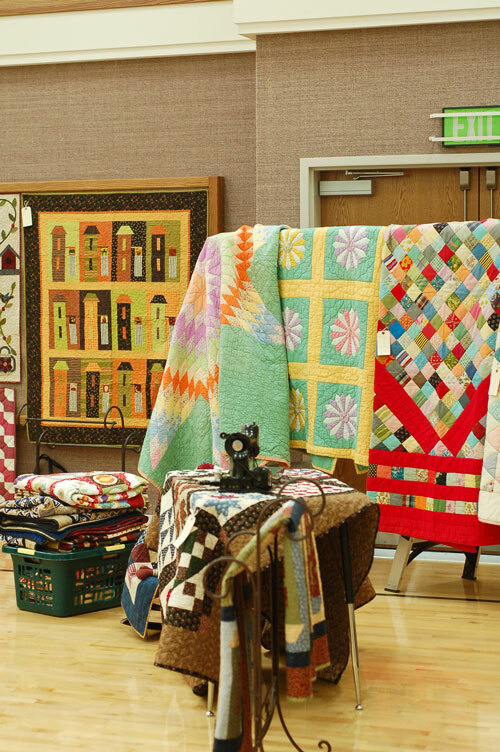 We had recently finished up a three week beginning quilting class, so we thought it would be the perfect occasion to have a quilt display. 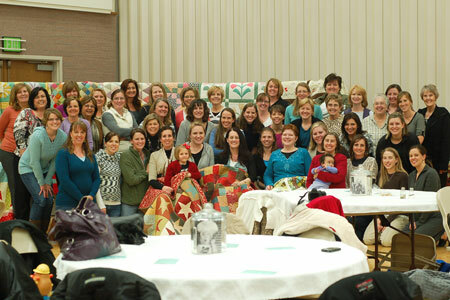 Many of the sisters who made table runners in the class brought them to share. 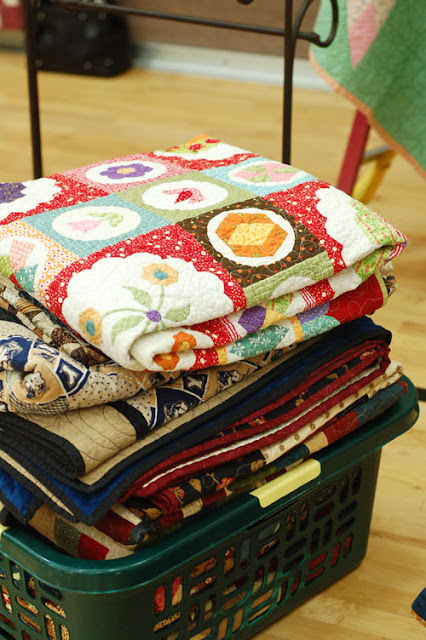 We also asked the other sisters to bring quilts they had made or vintage quilts they owned. We have some very talented quilters in our ward! Ruth did an amazing job displaying the 40+ quilts she gathered from everyone. She used a variety of ladders with poles, tables, chairs, quilt racks, etc. to drape and hang them. It was quite impressive. 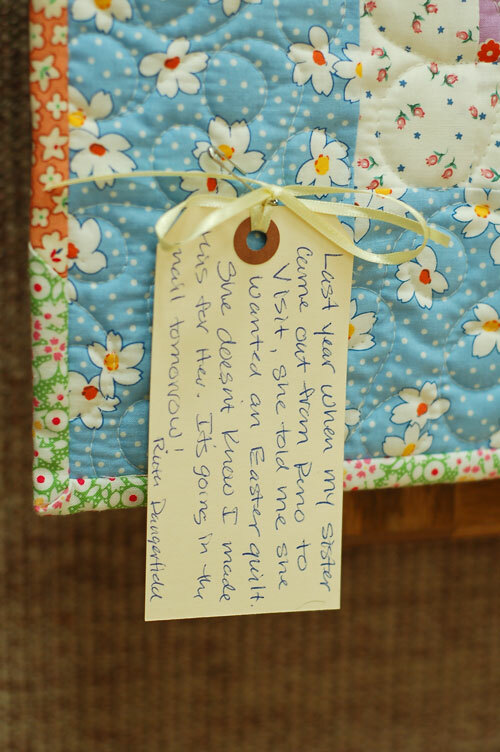 She also asked everyone to share the story behind each quilt or simply who made it/who it was for on a tag that was pinned to each quilt. 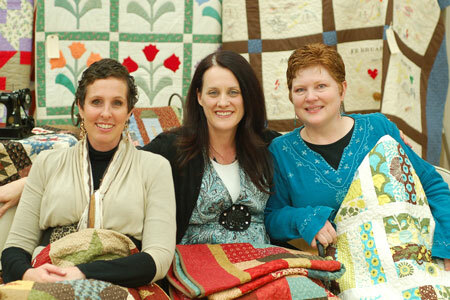 left to right: Delayne, Brenda and Shauna. 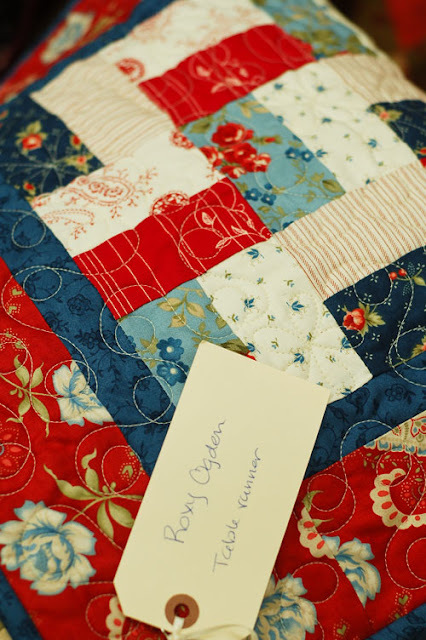 We also presented a very special quilt to our friend Brenda. She recently sustained a very serious injury and is confined to bed rest for three months! Uggh! We were so excited she was able to attend the celebration with us. 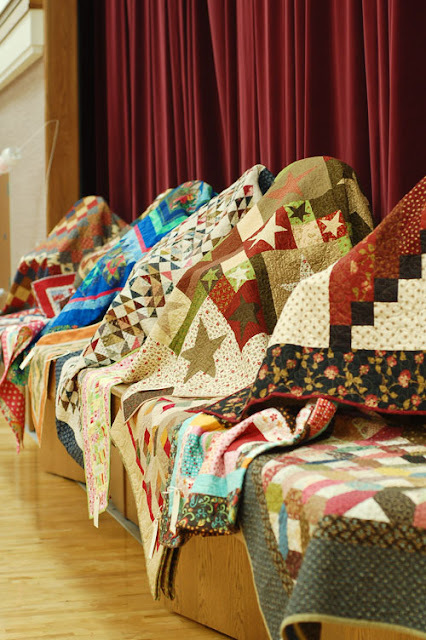 Many of the sisters in the ward got together and contributed to or helped sew the beautiful quilt she's holding on her lap. 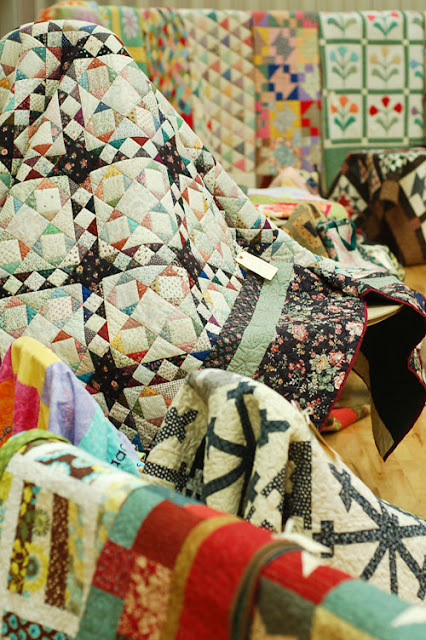 Delayne and Shauna have both survived cancer in the last year or two and have also received quilts we've made for them. 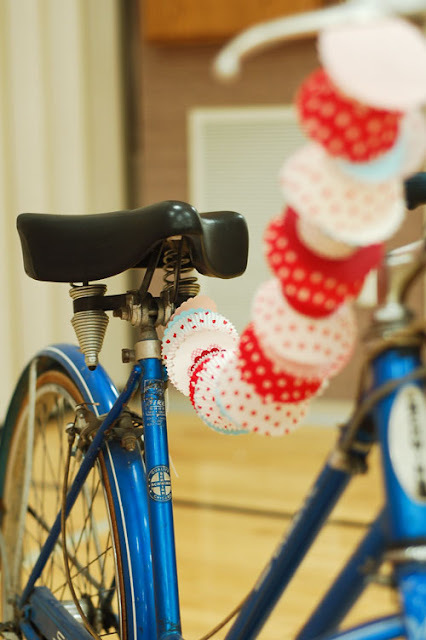 They shared how meaningful it was to receive such a special gift they could use throughout their treatment and be reminded of the love their friends have for them. We love these sisters so much. Don't get me wrong, my calling is still a lot of work. It's challenging and requires some mad organization skills. But I love it. And it's extremely rewarding for me to see the sisters shine by sharing the things they love most and helping others learn and develop new skills. 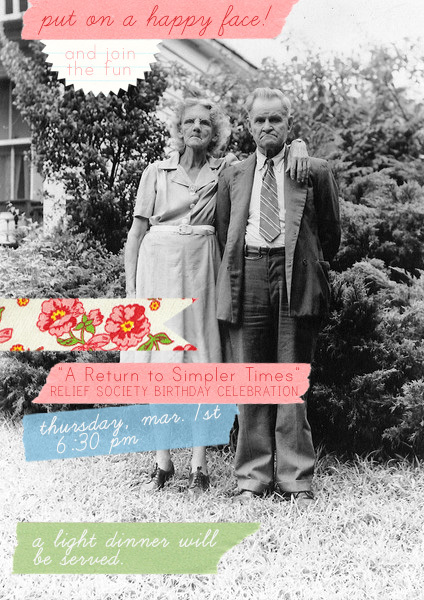 Happy 170th Birthday, Relief Society! Update: I have had so many women ask for the ads and photos we used for our birthday celebration. I have all the vintage ads in a folder you can download. The photos weren't saved, but Mr. Google can help you find some. From now on I'll have everyone send me their portion, and we'll make them available on the post. :) So glad you love our ideas! I am so sad I missed it. Looks like it was amazing! Kim: What a wonderful evening! I wish I were in your Ward. The quilts are amazing. When do you sleep? Carol, I wish you were in my ward too. I'd call you to the RS board so fast! Didn't lose any sleep, I have uber-talented women in my ward and I can delegate pretty well. Mary Kathryn, Congrats on your calling. It's a lot of fun. Just keep it simple and it'll stay that way. :) Hope I don't disappoint when it comes to ideas. I'll keep 'em coming. I am currently the RS activity planner and wanting to use your decorating ideas etc as we are doing a theme on simplifying our lives. 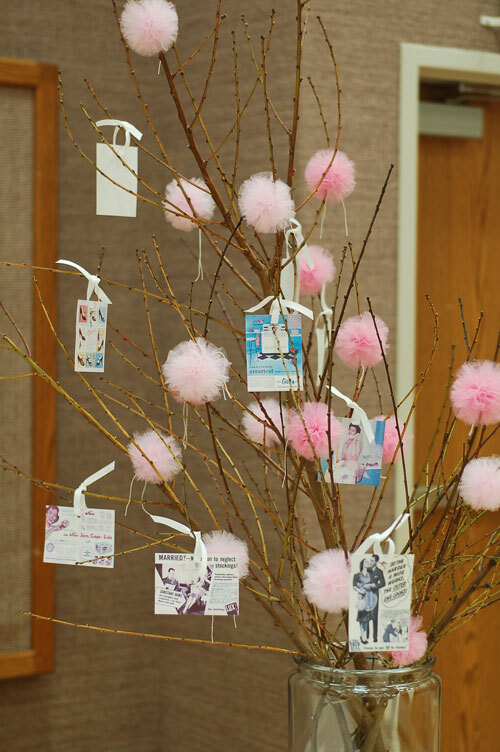 I am wondering if you have any of your old fashioned images that you hung on that tree and decorated with in a pdf or pse file etc so that i may use them for my acitivity? Please let me know if you are able to share those documents...thanks agian and love what you have done with this activity! Truly an inspiration!!! BJ, I tried to e-mail you the ads (can't believe I still had them! ), but you are a "noreply-comment." Either switch it (and let me know) or e-mail me and let me know your e-mail address. I'd be glad to send them. I just found your blog through pinterest also. We are doing a vintage tea party for our RS Bday celelbration next month. I love your little tulle pompoms! I think I might use that idea and would love the vintage photos that the previous commentor was asking for if you still have them! Thanks! I would also love those vintage ads/photos if it's possible. Thanks! Kim, you have done a wonderful job! Your pictures and descriptions make me feel like I'm almost there. ;) I am the activity counselor and would love to borrow your ideas. Would it be possible to get the vintage photo of the cute couple you used for your invite and also the vintage ads? Thanks so much for sharing your ideas! Hi. I am here as another poacher! I would love to draw from your creativity and wondered how you made the invite. I would like to use the same picture and adjust the info. Also, the vintage ads would be nice to have also. I love your quote revamp! Would you mind if I used it? I just right clicked and saved it but I'd love the full size image so I can blow up one to an 11x14 and then also give one out. I'm also the RS Meeting Coordinator and I need to take some lessons from you! P.S. I'd also LOVE the images you used on the trees. DARLING and I'd use them for another activity for sure. Okay, Friends. The vintage ads are available for download at the end of this post. (See the update.) There's a whole folder of them. The photos were handled by someone else, and she didn't save them. Darn! Just Google "vintage photos", etc. Hi! 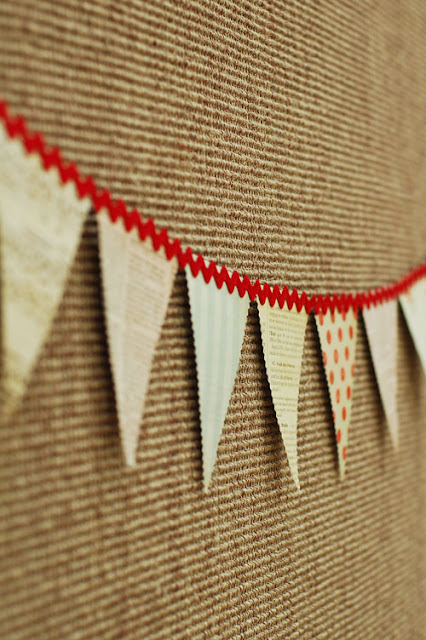 I also love the invitations you made! Wondering if there was a way for us to use it but change the info? Thank you for posting all of this! It saves a newbie to the relief society activity world like me! I love your blog and your ideas! thank you so much for sharing. I'm the RS activity leader for our ward and are planning to use this idea for our RS birthday party next month. Is there a way that we can get that quote in full resolution? I wanted to make a big poster. Thank you in advance! Thank you for your party idea! We used it for a RS dinner with the desire to invite EVERY WOMAN in our ward boundaries. Which we did! We had the biggest turn out ever in the history of our ward. 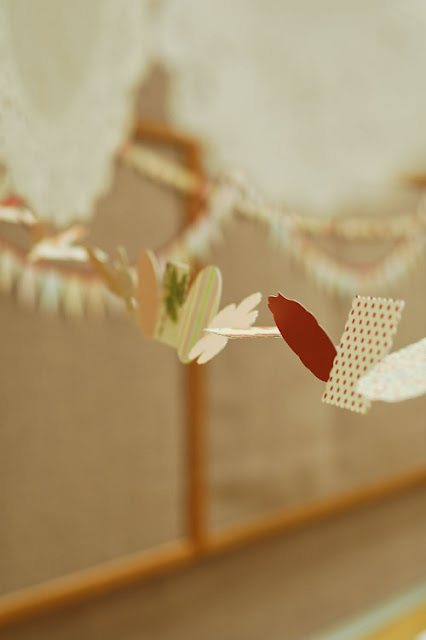 We borrowed your idea for invitation, menu, decorations. Thanks so much. I'd love to send you some photos. Can you send me the invite? capellaftc@aol.com Hoping to use it for our activity. Besides the dinner, beautiful decorations, handouts and RS Pres. speaking, was there any activity regarding simplifying? Does your president still have her little message on simplify our lives? If so, could you please share?